I recently had coffee with a good teacher friend. He was telling me that their district is moving from iPads to Chromebooks for next school year. Some of the other teachers were rejoicing because then the students “wouldn’t be playing games during class.” He pointed out to them that kids can, in fact, still play games on Chromebooks and the reply was “but they aren’t fun games.” He inwardly sighed and was thinking what most good teachers would think – this is a classroom management issue, not a device problem. So, how do we make sure students are engaged in the classroom? There has been much research to show that students (or anyone, for that matter) learn more when they have to teach someone else. I recently came across an article that takes it a step further, they learn more when they think they will need to teach someone at some point. Students are able to analyze, define, create, and evaluate information, skills, and concepts when they are actually doing something in the learning process. Add to active learning environments, a way to share the learning with an authentic audience, and the engagement (and bonus: the learning!) skyrockets. I’ve written posts before about the importance of authentic learning, and presenting the learning to authentic audiences. If students know they are going to be demonstrating their learning in front of experts in the field, their peers, and/or other adults (outside of the classroom teacher), they take more time to put forth their best effort. It goes a step further if they are sharing their work, globally, via some type of digital avenue. Questions we need to be asking: How do we increase the likelihood of student engagement? Make sure you are not lecturing from the front of the classroom (or worse, while sitting down at your desk for the entire period – kill me now…). Would you want to learn in your own classroom? How much interaction are the students having with one another, and with people outside of the classroom? Are the students moving around and driving their own learning trajectories during class? How are they showing their learning? To whom are they teaching? “Teaching” someone else can be as simple as having them turn and tell a partner what they just learned. This shouldn’t be the norm, but is a great method to get students thinking about their learning in a deeper manner. They can also blog about what they just learned. There are very simple solutions, and there are much deeper opportunities, as well. Each class, each lesson, and each student in unique – engage them accordingly. 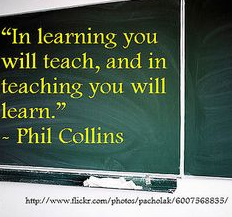 Please share some awesome ways you’ve seen students teach others to enhance their own learning experiences. This entry was posted in Education, Professional Experiences, Student Engagement Series and tagged active learning, personalized learning, students, teaching. Bookmark the permalink.